(Michael Barnes, Liberty Headlines) Representatives of western states are applauding the Trump administration for overturning a massive Obama-era land grab that brought tens of millions of acres under strict federal control — all to protect the sage-grouse. Under Obama, liberal Democrats and coastal environmentalists flocked to defend the ground dwelling bird from falling victim to economic development. But critics say it was just a ruse for the Obama administration and future bureaucrats to exert dominance over the American West. “The only reason the sage-grouse is even an issue and the greatest threat to Western communities, is because of politics,” said Rep. Paul Gosar, an Arizona Republican, on Friday after changes were finalized. “The Obama Administration saw the bird’s 165 million acre habitat as an opportunity to impose a massive land grab, limit grazing, prevent economic development on federal lands and stop energy production from sources with which they disagreed,” he added. Gosar is the chairman of the Congressional Western Caucus, a congressional delegation comprised of 72 bipartisan members from western states. The coalition was founded to combat undue federal interference over rural, agricultural, timber, water, energy and hunting values that have been a part of the western way of life for centuries. Members worked closely with President Trump’s Department of the Interior and Bureau of Land Management to repeal the sweeping land use restrictions that affected a greater total area than the size of California and Utah combined. “The Obama Administration’s scheme to use the Greater Sage-Grouse to shut down large swaths of land across the West – particularly grazing, oil, gas, and mineral development – resulted in devastating impacts for local economies,” Gosar said. “The Obama sage-grouse land grab cost our economy tens of billions of dollars in economic activity and tens of thousands of good-paying jobs,” he continued. The Western Caucus has decried the exalted treatment of the Greater Sage-Grouse despite it not being endangered or threatened, at least not by any reasonable legal or scientific definition. In 2015, the U.S. Fish and Wildlife found that protecting the sage-grouse under the Endangered Species Act wasn’t even warranted. 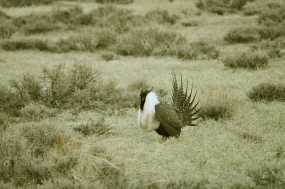 The sage-grouse is also already protected by numerous measures at the state-level across the greater west, the caucus said. According to a 2015 study conducted by the Western Association of Fish and Wildlife, the population of mating sage-grouse males exploded by 63 percent during a two-year period when the Obama administration was advancing its land takeover, which belied the reason for the move at the time. Western supporters of the Trump administration’s rollback said Friday’s decision isn’t about getting rid of the birds, in fact, quite the contrary. The new rules will only provide greater flexibility to manage sage-grouse habitats while opening space for development. It also incorporate significant local input in the process, something the Obama administration wasn’t interested in. Opponents the reform are expected to sue the administration and block any changes from taking place. Brian Rutledge of the Audubon Society told the Associated Press that the new revisions will make it harder save the sage-grouse because of the administration is favoring oil and gas companies over the environment.